Target Specific Users – Based on email marketing lists or a list of influential Twitter users. Website Visitors – Straight-forward website retargeting Resulting from marketers placing the Twitter pixel on their website and collecting data on website visitors. Mobile Apps – Very similar to website visitor targeting. The main difference is that it collects data for users engaging with a mobile app. 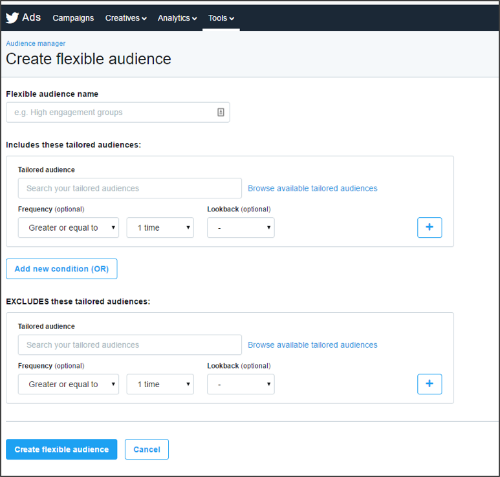 Twitter Flexible Audiences allow marketers to get a little creative with how they use them. This means that marketers can create Twitter audiences that pinpoint who they would like to reach, Marketers also have more control over how their message is delivered. The first addition is the use of AND/OR operators. AND/OR operators allow marketers to combine tailored audiences in unique ways. Marketers can target twitter users who are part of two different tailored audiences and show them compelling ad copy. For example, if marketers have a tailored audience made up of engaged prospects and another list of people who have requested information about their product or service they can combine those lists together and show them a compelling offer to turn them into customers. The second major addition is the exclusion feature. 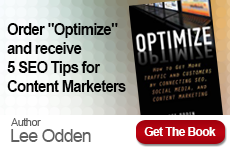 This feature allows marketers to drill down and make their tailored audience more specific. For example, an audience made up of all website visitors who have inquired about their product may contain current customers. To make sure these current customers don’t see the compelling offer their brand is showing to prospects they could exclude their current customers tailored audience from this campaign. The final change is frequency capping. As internet users we all know that retargeting can be extremely relevant advertising that can get extremely annoying. So many marketers don’t take advantage of frequency capping. This is the ability to limit the amount of ad impressions that an audience sees. 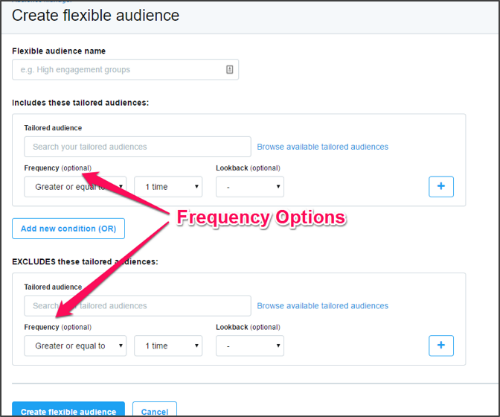 Twitter Flexible Audiences now features frequency capping. 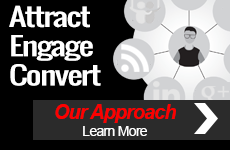 TopRank Marketing has always focused on providing their audience with the best answer. 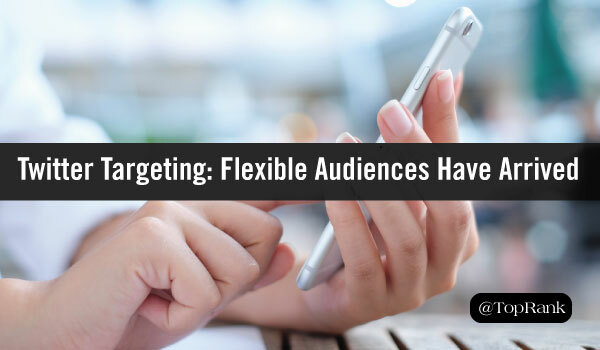 Twitter Flexible Audiences will allow marketers to provide audience with more relevant and timely information. 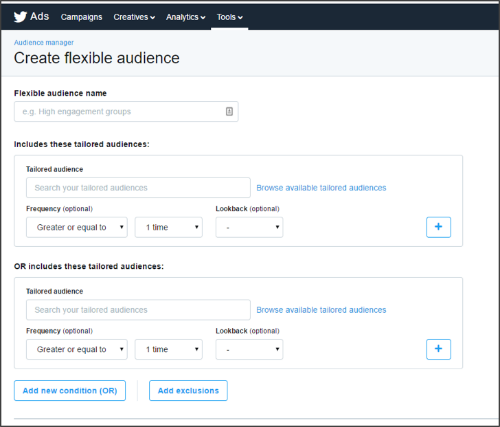 Have you tried using Twitter Flexible Audiences yet? If so, have you noticed an impact on ad performance?